Using iOS 10, iPhone 6S and iPad Air 2, the episodes do not play the audio. No reaction when I touch them. Each individual phrase will play in the dialog and vocabulary selection, but not the episode, review, or dialog. I tried closing all apps, quitting all other webpages, and even hard restarting the phone. Everything played just perfectly in iOS 9, but since the upgrade, the episodes do not play. We’re looking in to this right now. Apologies. Our IT team is currently looking into this but in the meantime, try clicking the download links. 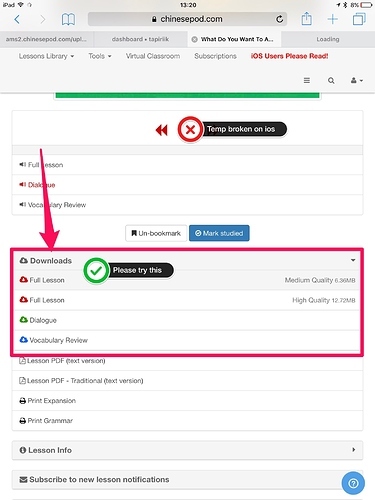 This will open up a new tab with the audio, and you can listen in the background while looking at the regular lesson tab. I’ll update you all when it’s fixed. Check this lesson for a fix for the player. You’ll need to clear your history for it to work possibly or you can just try refreshing the page a few times. We updated the player to the lastest version. iOS10 dropped support for the previous version.